Environmental issues have been at the forefront of government policies, the news and lifestyle changes in recent years. Many industries are committing to sustainable and environmentally friendly practices, and that includes the theatre industry. The performing arts have always had a political, cultural and economic impact on society, and the medium of theatre lends itself well to raising awareness of sustainability and environmental concerns. The umbrella term of ‘ecologically sustainable theatre’ has many facets, including educating audiences, reducing CO2 emissions in productions and using minimal resources in venues. In 2010, construction began for a rooftop solar installation at the Sydney Theatre Company in Sydney’s Walsh Bay. The project, Greening the Wharf, had been the long-time vision of the Company’s artistic directors, Cate Blanchett and her husband, playwright Andrew Upton. “We could be well on our way to becoming the first green arts precinct in the world,” said Blanchett. They’re not alone. They are many theatre groups and organisations within Australia who are passionate about eco-theatre. 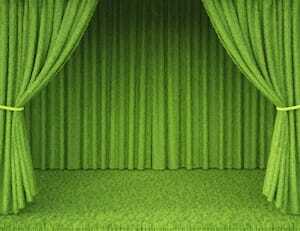 The Greening Our Performance Alliance encompasses companies and individuals involved in the performing arts, who want to reduce their carbon footprint and make the theatre industry more sustainable. They aim to share ideas, information, and solutions for reducing the use of resources such as theatre equipment, by running workshops and seminars. Julie’s Bicycle is working on making environmental sustainability intrinsic to the arts. The organisation was started in the UK, 2007, by prominent figures in the music industry, and it now operates internationally. Earlier this month, the organisation organised an Australian conference to discuss what the arts and culture can do to promote a sustainable, ethical and positive relationship with our environment and planet. Julie’s Bicycle aims to discuss what role the arts could and should play, and how they can raise public awareness of environmental sustainability and ethics. Greening up your venue or production doesn’t have to be expensive, or involve radical changes. Switching to low energy LED theatre lighting to reduce CO2 emissions; using sustainable resources when planning, designing and installing your theatre; recycling, where appropriate; and regularly servicing theatre equipment to increase its longevity are a few examples of practical steps you can take towards making your venue and performances more environmentally friendly.